You can call us today at 321-287-4466. You can also contact me by e-mail at theballoonatic@juno.com . 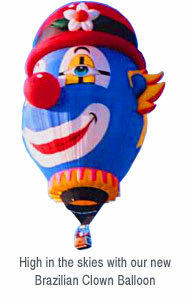 The Balloonatic stays very busy flying his balloon so don't worry if you don't reach us right away. He checks his messages and emails daily. Thanks for stopping by, we hope to see you real soon.